I take great offense with those comments. First, they show the lack of prep work made by the commenter, and second, they show that the commenter is subject to hindsight bias, where everything looks easy but only in retrospect. In reality, there was always a reason not to invest in dividend paying stocks during each of those past seven years that I dedicated to dividend growth investing. There is never a perfect time to start investing in dividend stocks. There is always a reason not to invest in dividend stocks. The truth is that dividend investing was never easy. I myself started investing in dividend paying stocks at the worst time possible, which was in late 2007 – early 2008 period. This was the worst time possible to start investing in stocks in general, let alone dividend paying ones. I also launched my site at the time, in order to write down my ideas, and make myself do the work required to form an opinion on quality dividend paying stocks. Some of you remember the dark days from 2008 and 2009, when many companies crashed, stocks kept falling from their highs by over 50% and several prominent bank payers slashed dividends. Those were some pretty scary times, as evidenced by the fact that some companies accepted usurious interest rates on loans from Berkshire Hathaway (BRK.B), mostly because they needed the funds, but also because they wanted Buffett's stamp of approval to calm investors. It was pretty scary to watch any news during that time, because I feared the whole economy would collapse. Nevertheless, I kept putting money to work every month during that time. It is insane to think about it now, but some of the best blue chip dividend stocks like were available at fire-sale prices. For example, I was able to purchase shares of Altria (MO) at $15.11 and Chevron (CVX) at $64.35 in early 2009. Even as late as August - September 2009, one could buy companies like Phillip Morris International (PM) at $46.94/share. Then in 2009, stocks started going up after hitting multi-year lows. That’s when we had fears of inflation, fears that there was a disconnect between stock prices and the real economy, unemployment was bad and stocks were too high. That’s when I kept adding to my portfolios, and were still able to find stable dividend paying companies, that were available at attractive prices. In 2010, I was able to keep putting money in dividend paying stocks, every single month. I was doing much better income-wise starting in 2010, relative to 2007, 2008, or 2009, which is why I was able to put even more money to work in dividend paying stocks. In 2010, we had fears of a double-dip recession, the TARP plan was being ridiculed left and right, and everywhere I looked there was doom and gloom. In fact, this doom and gloom is everywhere, and has only recently started to fade away. The majority of individuals I have talked to since 2009 have been in disbelief whenever I would inform them that the recession has been over since 2009. What made it psychologically difficult to commit money to dividend paying stocks in 2010 as the fact that preferential tax rates on dividends and capital gains were set to expire that year. This was a fear a couple of years later, although congress finally managed to extend those breaks, while raising rates for highest earners. The years 2011 and 2012 were characterized by double dip recessions in Europe, Greece defaulting on its debt, and more fears about debt ceilings, and tax rates. It was not an easy time to put $1000, $2000 to work in Aflac (AFL) or McDonald's (MCD) or Walgreen (WAG). It was also tough because some of the companies, like Johnson & Johnson had issues on their own, which made many investors want to sell their shares at $60. This is when I kept adding to the stock, which is one of my largest portfolio holdings today. When I look at old articles I have written between 2010 and 2012, they mention Johnson & Johnson quite frequently. Yet, many readers didn’t like that and complained about it. In retrospect, what looks like a no-brainer decision when Johnson & Johnson is at $105/share, looked like a very scary decision back in 2010 – 2012. Between 2009 and early 2013, a common fear I heard from investors was that “stocks are too high”. Looking at my archives, I even wrote several articles which discussed the fact that there are always some quality companies that are selling at attractive valuations. The reason why I kept putting money to work for me in my dividend portfolio is because I had goals and a dividend growth plan to achieve them. This plan was helpful in outlining the steps that need to be taken in order to achieve my goals. I didn’t have all the steps codified, but the message has been clearly repeated ad nauseum on this site for several years: invest in quality companies at attractive valuations, diversify, dollar cost average, reinvest dividend selectively, keep screening the list of dividend growth stocks regularly, keep learning more about companies, business and develop strategy. Ignore the noise. The other factor that really made me stick through my strategy through thick and thin was the reinforcing power of cash dividends which I receive in my brokerage accounts. When you get a dividend check from the company you invested in, it further solidified the idea that I am investing in real businesses, and not in some lottery tickets. The first dividend checks were a small drop in the bucket initially. This stream has been increasing in size, frequency and intensity. The goal is that this stream will cover my expenses in a few years or so. When you receive a stream of income which grows faster than raises at your job, which comes from global business powerhouses with growing earnings, it is pretty easy to ignore the opinion of the stock market and keep at your plan. There is always something to worry about. The way to be successful is to buy shares in good companies that you understand, and buy them at attractive prices. If you have a diversified portfolio of solid blue chips, purchased at attractive prices, with long histories of dividend growth, which have catalysts for further growth in earnings, you can’t go wrong if you are patient and have a long-term time frame. And by long-term, I don’t mean next week, I mean that you should be fine collecting dividends, even if they closed the stock market for 10 years. In fact, the dividend haters often claim that dividend investors will get scared from a 20% decrease in stock prices. I am really hopeful that they are right and we do get a 20% drop. I promise to act scared, as long as I can get that 20% drop. Inside, I would be ecstatic, since I would be able to buy more future dividend income with less dollars. As someone in the accumulation phase, a bear market would definitely make it easier to achieve my goals faster. There are several companies I own, which are trying to do a corporate inversion, in an effort to renounce their US corporate citizenship. This inversion is achieved when a US based company buys a foreign corporation, and as a result moves its legal domicile in the foreign country. As a result, the new combined company would be treated as a non-US company in the eyes of the US tax authorities. This is appealing to companies, because they would only owe US income taxes on income derived solely from US operations. Under current laws and regulations, US companies that earn money abroad have to pay steep tax bills if they were to repatriate those funds to the homeland, in order to pay dividends, buy back stock or invest in the business. Once an inversion is complete however, these companies would not owe any taxes on income that is earned from foreign operations. As I discussed earlier, most of the companies that dividend investor tend to buy earn a very high percentage of revenues from abroad. This is the nice thing about owning a solid blue chip, which sells branded products and services around the globe, and earns more money to pay higher dividends to you over time. There are some details that need to be met in order to do this inversion, such as the fact that at least 20% of shareholders of the new company need to be foreign, but this is not the point of this article. The important thing to remember is that inversions generally help reduce the tax rates of companies. From a tax perspective, if you are a US company and your top income tax rate is 35%, it does make sense to relocate to Ireland and pay a tax rate of 12.50%, if you can get away with it. This is essentially what an inversion does. As a shareholder, less expenses translates into more earnings per share. In addition, cash that is locked abroad for so many US companies that do business internationally will now be easier to access for dividends, share buybacks, investment in the business. Furthermore, if the company relocated to a place like UK for example, dividend income is not subject to any withholding taxes to the US investor. Hence, those shares could still be held in tax-deferred accounts such as IRA’s. So at first glance, it seems like inversions are a good thing to shareholders of the acquirer, since they will result in higher earnings per share, and the possibility for higher dividends and share prices as a result. As I dug deeper however, I learned that there is a tax that ordinary shareholders like you and me have to pay on inversions. When the tax inversion occurs, shareholders of the acquirer will be treated as if they sold their stock and then purchased the stock in the new, “inverted” company. This creates a taxable event, which means that investors would have to pay a tax on their gains. If the price at which investors acquired their shares was higher, then they might end up deducting losses. In the cases of Medtronic (MDT) and Abbvie (ABBV) however, I believe that most long-term investors are sitting at nice unrealized gains. The only consolation is that stock basis would be stepped up after this exercise. However, the forced tax leakage would be costly for long-term investors like me. My cost basis in companies like Abbvie (ABBV), Medtronic (MDT) and Walgreens (WAG) is around 2 times lower than current prices ( I have been acquiring shares in each of the companies and their predecessors between 2008 and 2013). Only a small portion of my positions in each company is in tax-deferred accounts. 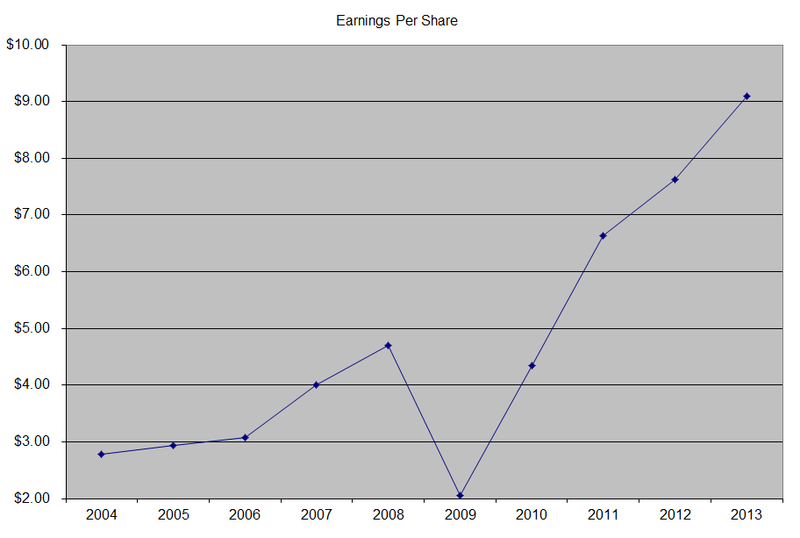 For example, my basis in Abbvie is $29.43/share, while my basis in Medtronic is around $35/share. I try to seldom sell, because I have to pay taxes. This reduces amount of money I have working for me. By not selling, I have a deferred tax liability to the IRS, which I hope to never pay. This is money I owe, but I don’t pay interest on. This is essentially float, that further helps me achieve financial freedom. It also means I have more money compounding for me. If I sell, I pay tax, and have less money to invest. The opportunity cost of a dollar paid in taxes, that grows by 10%/year for 50 years is $117. At a 3% yield, this is almost $3.50 in income in 50 years, for each dollar I put to work today. That is $1 less working for my descendants or my charitable causes. These are not good news for any long-term holders like me, who have low tax bases. This is another reason I am trying to max out any tax-deferred accounts, in an effort to shield as much of my money from the crippling effect of annual taxes on my capital gains and dividends. Those friction costs do cost money, that means less money available for my dividend machine to use for its compounding purposes. Either way, over time, expansion of a business is good, since synergies are achieved, taxes are lowered, and this improves the earnings capability of the business. This increases the worth of the business, and the ability to pay higher dividends over time. The ability to pay dividends is further increased by the ability to access cash stored abroad at ease. So the net effect could be positive of course for the patient long-term holder. The effects would be really positive for the patient long-term holder, who placed their shares in a tax-deferred vehicle such as a Roth IRA. I guess I am learning something new every day. Today is no exception. I thought this was a good deal for shareholders, since corporate taxes will decrease, which increases EPS, and allows companies to be able to access cash abroad for purposes of higher dividends and buybacks. However, this has to be weighed against the tax hit which many long-term investors are facing. What is really bad is the fact that most stock is owned through mutual funds, which do not care about many things such as corporate governance, taxes etc. For those who believe index funds are the way to go, you are one of the reasons why corporate managements think they can do what they want to do. When you have passive owners, who do not believe “active management” produces alpha, you are setting up really perverse incentives for management on executive compensation, corporate strategy, short-term thinking etc. Hat tip to a reader in France, for alerting me to this topic. The company’s latest dividend increase was announced in May 2014 when the Board of Directors approved a 17.60% increase in the quarterly dividend to 60 cents /share. "Deere is well-positioned to benefit long-term from global trends that hold great promise for the company's customers and investors," said Samuel R. Allen, chairman and chief executive officer. "Our dividend increase reflects our confidence in Deere & Company's ability to generate strong cash flow throughout the cycle. We remain committed to our plans for profitable growth and for returning cash to shareholders." The company has managed to deliver a 21.30% average increase in annual EPS over the past decade. Deere is expected to earn $8.55 per share in 2014 and $7.73 per share in 2015. In comparison, the company earned $9.09/share in 2013. Deere also has an impressive record of consistent share repurchases. Between 2004 and 2014, the number of shares declined from 506 million to 379 million. I have been biased against Deere, because it looks like a cyclical company, which managed to get lucky and ride a profitable trend over the past decade. As most of you are aware of, the past 10 – 15 years have been characterized by the rapid growth in emerging economies, which has lifted the boats of a lot of other companies. I am afraid that Deere might keep capitalizing on the those emerging markets, but at some point in time, it would have to go back to being a cyclical company with cyclical earnings. This could be a decade down the road, or could occur within the next few years. As a dividend growth investor, my goal is not only to find a cheap stock with a good dividend, but also a company that can grow earnings over time. If earnings per share are not increased over the next decade, most of dividend growth will come from increases in the dividend payout ratio, which is seldom a good sign for dividend income stability. I simply do not view Deere as the type of set it and forget it dividend growth stock that I can pass on to my heirs. That being said, it could still be a profitable investment for someone who buys today, given the low valuation, even if earnings do not increase by much. That would be true, as long as earnings per share do not decrease. Long-term prospects could be brighter than I imagine however. An increasing world population should continue to exert pressure on food supplies, which in effect could raise the demand for new efficient farm machinery. However, if commodity pricing pressures farmer’s profits, demand for equipment could soften. New products could be another boost for farming equipment, as is a cycle to upgrade old equipment over time, in an effort to boost productivity. The company has strong position in North America, with an established brand name and a 50% market share, which should provide it with a good scale of operations. I also like the fact that management seems very shareholder friendly, as evidenced by their commitment to dividend growth over the past 20 years, the consistent share buybacks, and the fact that operations are run pretty well. For example, the finance division has pretty low loan losses, which is encouraging and shows that proper credit evaluation is being done before lending money to farmers. I also like the fact that the largest shareholders is Cascade Investments LLC, which is the holding company that holds the investment portfolio of Bill Gates. I have been reading some about Bill Gates, and have found that his holding company is managed by Michael Larson, who is a very successful value investor. The annual dividend payment has increased by 16.30% per year over the past decade, which is lower than the growth in EPS. 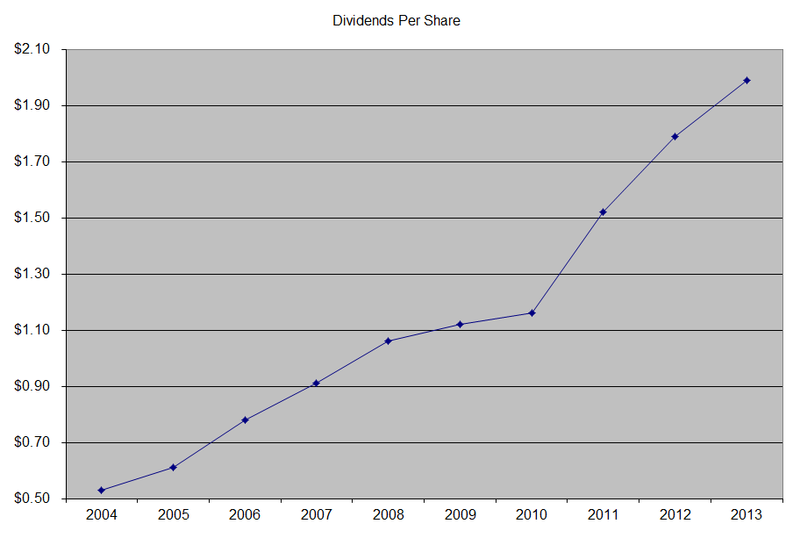 A 16% growth in distributions translates into the dividend payment doubling every seven years on average. If we check the dividend history, going as far back as 1989, we could see that Deere has actually managed to double dividends every eight years on average. What makes this analysis tricky however the fact that the company cut dividends in 1982 is, and the annual dividend didn’t exceed the 1982 highs till 1990. The annual dividend from 1982 didn’t really double until 2005. 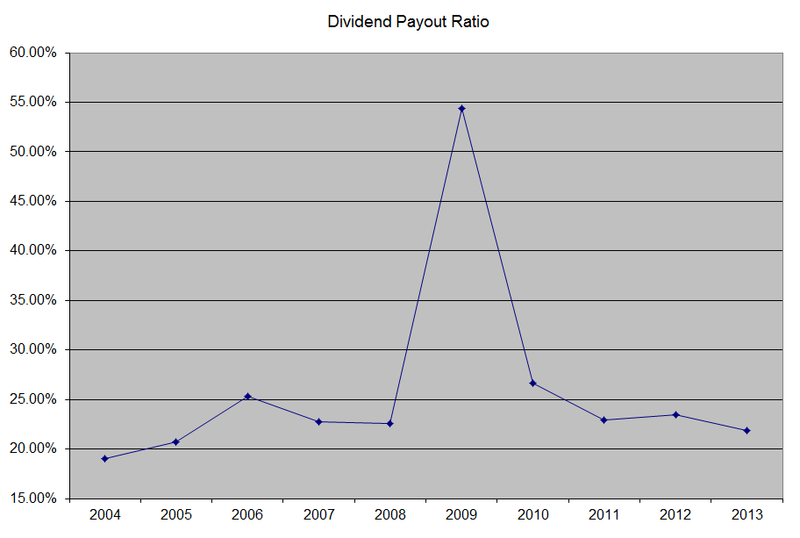 Over the past decade, the dividend payout ratio has mostly remained low below 25%, with the exception of 2009. A lower payout is always a plus, since it leaves room for consistent dividend growth minimizing the impact of short-term fluctuations in earnings. 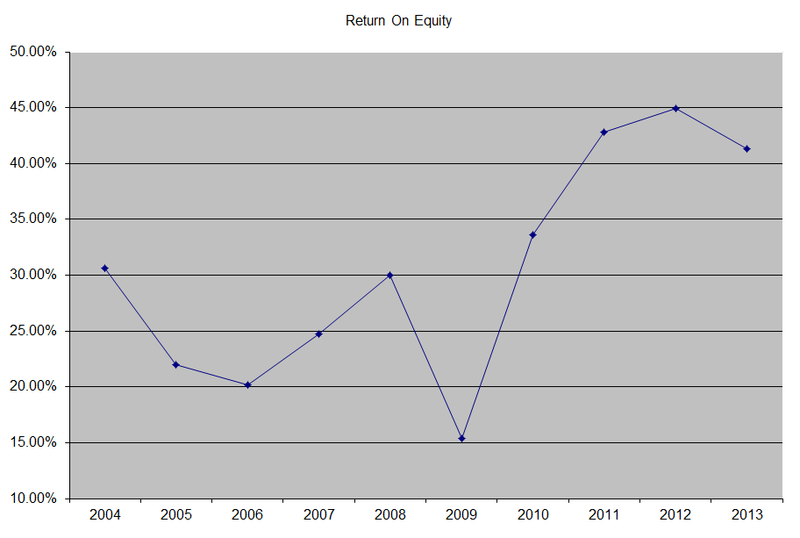 Deere has managed to increase return on equity from 30.60% in 2004 to 41.30% in 2013. Rather than focus on absolute values for this indicator, I generally want to see at least a stable return on equity over time. Currently, the stock looks cheap, as it trades at a forward P/E of 10.40 and a current yield of 2.60%. I believe that the business is more exposed to economic cycles than the typical dividend growth stock that I usually focus on. However, when a business is cheap, it can still generate shareholder value even if there is only a small improvement. With Deere, the $8 billion share buyback could be one catalyst that could result in better returns going forward. As a result, I initiated a small position in the stock this week. US stocks these days are offering much lower yields than the rest of the world. For example, S&P 500 yields less than 2%, while UK stock indices are yielding more than that. Given the fact that foreign companies are paying more generous dividends that US ones, should dividend investors venture abroad? Before investors decide to invest in foreign stocks, they need to understand the risks and peculiar characteristics of foreign dividend paying stocks. In general, most foreign dividend paying companies pay fluctuating dividends each year. Foreign companies are quick to cut dividends if earnings fall even by a small amount, since they target a particular dividend payout ratio, rather than a particular level of dividend payments. US investors who are used to the stability of dividend payments that most American firms exhibit might be disappointed by this feature. Fluctuating dividends make it particularly difficult to live off your investments, and as a result it is best that these companies are avoided. Adding to the injury, most foreign companies tend to distribute cash to shareholders once or twice per year at best. Many multinationals such as Nestle (NSRGY) for example pay distributions once per year. As a result, investors who like to reinvest dividends have only one instance/year to compound their profits. As a dividend investor, I have found that having the ability to reinvest the same annual dividend in four quarterly installments allows for faster compounding than having the dividend compound just once per year. For the companies that pay dividends twice annually, they tend to split distributions into interim and final payments. The interim payments typically represent 40% of the total annual dividend, while the final payment represents 60% of the total annual dividend. As a result, many US services such as Yahoo!Finance, routinely miscalculate the dividend yields of companies such as UK based company Diageo (DEO), or Vodafone (VOD). Another factor to consider before purchasing foreign shares is taxes. Many countries such as Canada, France, Switzerland and Netherlands, to name a few, impose taxes on dividends paid out to US investors. These taxes are typically around 15% for Canadian stocks held by US investors for example. While US investors can claim a credit for any taxes withheld at a foreign source in taxable accounts, they cannot do that in tax-deffered ones such as ROTH IRA’s. In addition, some foreign companies such as Unilever have dual class shares with similar rights that trade both in London and Amsterdam. Purchasing the Netherland based ADRs for Unilever N.V. (UN) could lead to tax withholdings, whereas purchasing the United Kingdom based ADR’s for Unilever PLC (UL) could pose no such problems. US dividend taxes would still be due of course, but there is less paperwork trying to claim foreign taxes withheld on dividends. Another factor to consider includes transaction costs. Many US investors tend to purchase American Depositary Receipts (ADRs) on foreign listed shares. As a result, they end up paying US capital gains taxes and US commissions. If you dare to venture abroad however, you would have to deal with finding the right broker, paying taxes abroad and paying commissions which are probably much higher than the ones in USA. In general, many foreign companies also report results under IFRS, which is a different accounting standard than the US GAAP. Other factors to consider include the fact that many foreign companies listed in the US are typically global businesses, and therefore would trade similarly with their US competitors. In other words, during the financial crisis of 2007 – 2009, many stocks lost almost half of their values. As a result, venturing out abroad might not have delivered the diversification benefits that international investing is supposed to deliver. However, by expanding the time-frame to look at performance of foreign shares before and after the crisis, one could note a few differences. Because of the global nature of business these days, I avoid international over diversification by purchasing shares of US based multinationals. There are a few lists with dividend growth stocks, which could aid investors in their search for dividend paying companies with dependable and rising distributions. These include the international dividend achievers index, which lists companies traded in US, which have boosted distributions for at least 5 years in a row. Another interesting benchmark is the Europe Dividend Aristocrats index, which lists European companies which have raised distributions for over 10 years in a row. Diageo (DEO), which produces, distills, brews, bottles, packages, and distributes spirits, beer, wine, and ready to drink beverages. The company has managed to increase dividends for at least 15 years in a row. Currently, the stock is selling for 19.70 times forward earnings and yields 2.70%. Check my analysis of Diageo. Nestle (NSRGY), which provides nutrition, health, and wellness products worldwide. The company has managed to increase dividends for 18 years in a row. Currently, the stock is selling for 18.60 times forward earnings and yields 3.10%. Check my analysis of Nestle. Novartis (NVS), which is a multinational company specializing in the research, development, manufacturing and marketing of a range of healthcare products led by pharmaceuticals. The company has managed to increase dividends for 17 years in a row. Currently, the stock is selling for 17.50 times forward earnings and yields 3%. Check my analysis of Novartis. Unilever (UL), which is a consumer goods company operating in Asia, Africa, the Middle East, Turkey, Russia, Ukraine, Belarus, Europe, and the Americas. The company has managed to increase dividends for at least 19 years in a row. Currently, the stock is selling for 20.20 times forward earnings and yields 3.50%. Check my analysis of Unilever. BHP Billiton (BBL), which operates as a diversified natural resources company worldwide. The company has managed to increase dividends 15 years in a row. Currently, the stock is selling for 16.80 times forward earnings and yields 3.50%. Check my analysis of BHP Billiton. Those companies are a little pricey today, but are good long-term holdings for long-term investors. If prices decrease from here, it would be nice to have those company on a watchlist.